The new Elantra has achieved the challenge to be the safest car, and we will keep challenging ourselves to be even better. What are your challenges? Share your challenges and goals and get a chance to receive Amazon.com Gift Card*! Choose a challenge and share in the blank template or create a challenge using the automatic challenge generator. Please enter your information for the prize collection. Your information will not be used other than the purpose of contacting winners. *I agree to receive Hyundai newsletter. *I agree to be contacted by Hyundai dealer. In order to contact you via phone, you must agree to the statement below. If you do not agree, we will contact you via email instead. I consent to receiving telemarketing calls or texts at this number using an automatic telephone dialing system by, or on behalf of, Hyundai Motor America and its authorized retailers. I understand I do not have to consent in order to purchase any products or services. Carrier charges may apply. YOU HAVE SUCCESSFULLY PARTICIPATED IN THIS EVENT. SHARE YOUR CHALLENGE WITH OTHERS! Winners will be selected in a random drawing from among all eligible entries received during the sweepstakes period. Winners will be announced via website on April 26th, 2019. Winners will also be notified via phone and/or email provided on the entry form. If the winner does not claim the prize within five (5) business days of the first notification attempt, then the prize will be forfeited and may be awarded to an alternate prize winner in a random drawing from among all remaining eligible entries received during the sweepstakes period. Please see Event Rules for more details. The sweepstakes is open to legal residents of the forty-eight (48) contiguous states of the United States and the District of Columbia, who are at least eighteen (18) years of age and possess a valid driver’s license at the time of entry. Incorrect, inaccurate, or incomplete entries will be disqualified from the sweepstakes. Actual prize may vary from image shown and may be substituted for a prize of equal or greater value. NO PURCHASE NECESSARY. SWEEPSTAKES ENDS 11:59:59 PT 4/15/19. VOID WHERE PROHIBITED. RULES: https://bit.ly/2J6fbY8. 1Forward Collision-Avoidance Assist (FCA) and Automatic Emergency Braking (AEB) with Pedestrian Detection help detect pedestrians, but not in all conditions. FCA and AEB are designed to assist drivers to avoid, or reduce the severity of, collisions with cars that have slowed or stopped in front of them. They are supplemental assist and do not replace the need for extreme care and attention by the driver. FCA and AEB may not stop the vehicle completely and will not avoid all collisions. See Owner’s Manual to learn more. 2Do not rely completely on Blind-Spot Collision Warning (BCW) and be sure to use proper lane changing procedures. BCW may not detect every object or vehicle and will not prevent accidents. Lane Change Assist provides an audible and visual alert if the turn signal is activated and another vehicle in the blind spot is sensed. There are limitations to the function, range, detection and clarity of these systems. See Owner’s Manual for details. 3Lane Keeping Assist operates above approximately 44 mph and only when the lane markings are clearly visible on the road. It will not work under all circumstances and will not prevent loss of control. It is a supplemental assist, and does not replace the need for extreme care and attention by the driver. See Owner’s Manual for details. 4Based on total package of warranty programs. See dealer for LIMTED WARRANTY details. 5Original owner only. 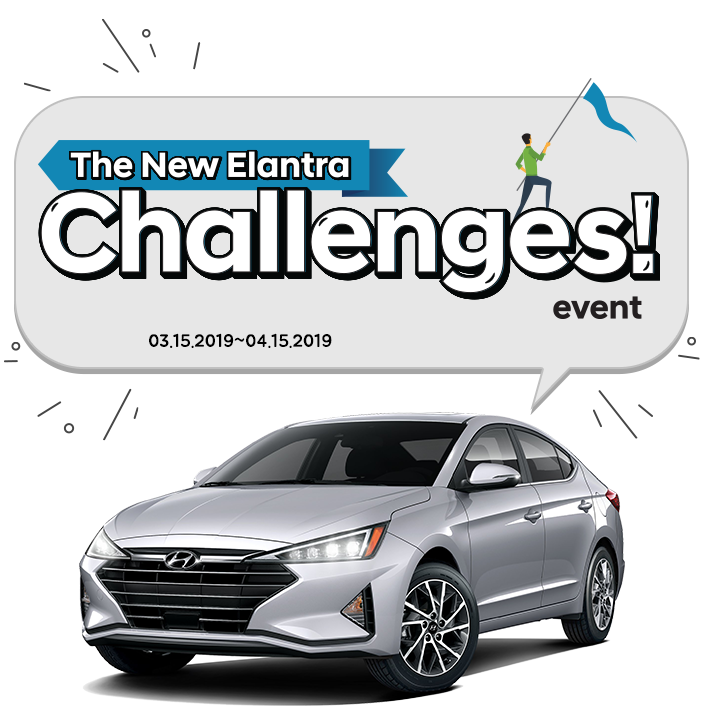 Elantra is generating your challenge. For the second year in a row, the Insurance Institute for Highway Safety (IIHS) announced that Hyundai has the most combined TOP SAFETY PICK+ and TOP SAFETY PICK-rated vehicles in the automotive industry. The Ioniq Plug-in Hybrid has taken home its first ever TSP award, bringing Hyundai’s total to an industry-best 10 awards. No other automaker can match this level of safety. The New Elantra’s dedication to be the safest car is evident with Hyundai Smart Sense, which provides the latest safety technologies. The 2019 new Elantra comes with Forward Collision-Avoidance Assist1, Blind Spot Collision Warning2 and Lane Keeping Assist3 as standard safety features (Except SE model).